This study examined the effect of the addition of Beauvaria bassiana on the effectiveness of Nicotiana tabacum extract as a biopesticide against coffee berry borer (CBB) or Hypothenemus hampei. A six months field experiment was carried out to examine the combined biopesticide effect on robusta coffee plantation. Randomized complete block design (RCBD) was used as a model for this experiment that consists of two factors. The first factor was the composition of Beauveria bassiana in water (0 to 320 g), while the second factor was Nicotiana tabacum extract composition in water (10 to 30 mL). The results showed that the dosage of Beauveria bassiana had a significant effect on tobacco biopesticide extract on the percentage and the intensity of CBB attacks. 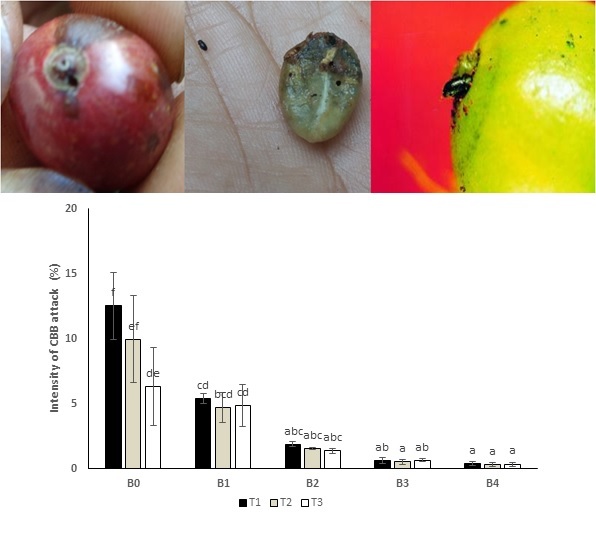 The combination of 320 g Beauveria bassiana /8 L of water and 30 mL Nicotiana tabacum extract/10 L of water, in our experiments (B4T3) could reduce the percentage and intensity of coffee fruit attacked by CBB to 1.54% and 0.33%, respectively. Coffee is one of the important plantation commodities that have high economic value in Indonesia (Rahardjo, 2012). The major problems in coffee plantation are low productivity and quality. Coffee production is influenced by the suitability of the growing environment, cultivation techniques, varieties, and the presence of plant-disturbing organisms. Coffee berry borer (CBB) is one of the causes in low production and quality. In addition, CBB attacks the coffee when it is stored. CBB attacks the young to old berries, causing perforated seeds. This also affects the quality of coffee produced. Beauveria bassiana is one of the entomopathogenic fungi that potentially developed as an alternative biological control for CBB. B. bassiana infection develops causing cell function damage. The toxins produced by B. bassiana are beauvericin, beauveroulite, bassianaliti, isorolite, and oxalic acid. The toxins play a role in damaging the digestive tract, muscles, nervous system, and respiration of the CBB (Mahr, 2003). The resulting enzymes, such as proteases, lipolytic, amylases, and chitinase, play a role in hydrolyzing protein complexes in the integument. The use of synthetic pesticides is more effective; however, it is harmful to the environment and human body. Nowadays, the biological control of CBB pests is developed in Indonesia as a result of increasing demand for bio-coffee. Biological control agents are able to control CBB pests, relatively safe, and easy to use. Tobacco biopesticide (Fauzantoro et al., 2017; Wijanarko et al., 2017) is one of the biological control agents that expected to control the CBB attacks. The advantages of biopesticides are that it is easily degraded, leaves no long-term residue, is fast acting, has low mammalian toxicity, and low phytotoxicity. Tobacco can be used as insecticide because it contains nicotine, D-limonene, and pyridine (Gozan et al., 2014). Pyrolysis and reflux extraction methods have been used to increase the yield of bio-oil as biopesticide from Nicotiana tabacum (Gozan et al., 2014; Purwanto et al., 2015; Supramono et al., 2016; Fauzantoro et al., 2017). Nicotine alkaloid, nicotine sulfate, and other nicotine content are used as contact poison, fumigant, and stomach toxins (Hasanah et al., 2012). Nicotine as the fumigant will evaporate and penetrate into the integument of insects causing death (Matsumura, 1975). The content of tobacco extract (Fathi et al., 2018) is an active compound, such as terpenoids. Terpenoids have a bitter taste and antifeedant that can inhibit normal feeding behavior of insects (Gozan et al., 2014). Terpenoids are also insect repellents. This compound acts as a stomach poison through food into the gastrointestinal tract (Jumar, 2000). These compounds affect the function of nerves because they inhibit cholinesterase enzymes, causing impaired transmission that decreases the coordination of muscle work and then death (Foster et al., 2011; Afifah et al., 2015). Terpenoid mechanisms start by inhibiting the arrangement of calcium ions (Ca2+) in the insect muscle system, then stimulate muscle contraction resulting in paralysis and death (Pu’u, 2010). The authors acknowledge the research funding from the Ministry of Research, Technology and Higher Education through Decentralization Scheme No. 009/K6/ KM/SP2H/RESEARCH/2017. The authors also gratefully thank the funding from USAID through the CDSR SHERA program (4495/UN2.F4.D/PPM/2017). We thank Siti Fauziyah Rahman, Ahmad Fauzantoro Sapto Priyadi and Achmadi Priyatmodjo for technical supports.